This figure comes in tons or articulation. 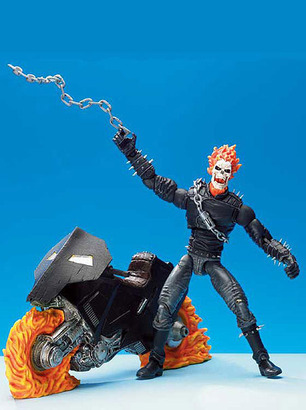 The chain whip can actually be clipped around the body of Ghost Rider. The bike is steady as the wheels on both ends are actually flat. Cool looking even for Dan Ketch but he will never touch his mentor Johnny Blaze! I like the wall mounts on this toy...gotta love versatility!